The cheese should also have some burnt spots in it and be totally melted, so that when you pull a piece away from the pie, it should have those thin, gooey mozzerella strands dangling all the way from your mouth to the pie, before snapping apart! Pizza’s my favorite food because it’s just so mouth-waterin’ yummy, satisfying and yet plentiful and convenient; not to mention, cheap. There’s a pizzeria in every town, isn’t there, and don’t they ALWAYS deliver? You can get a slice for about $2.50 here in New York and it’s no secret that we have the best Pizza here, of course! Now I KNOW, that some folks will argue that the “Chicago-style” or deep dish pizza, is just as good if not better, but we discriminating, persnickety New Yorkers like the italian stuff with a nice (semi-thin) burnt crust, and just dripping with greasy goodness! Sometimes it’s so greasy you have to drip or blot the excess out on a paper plate or napkin! 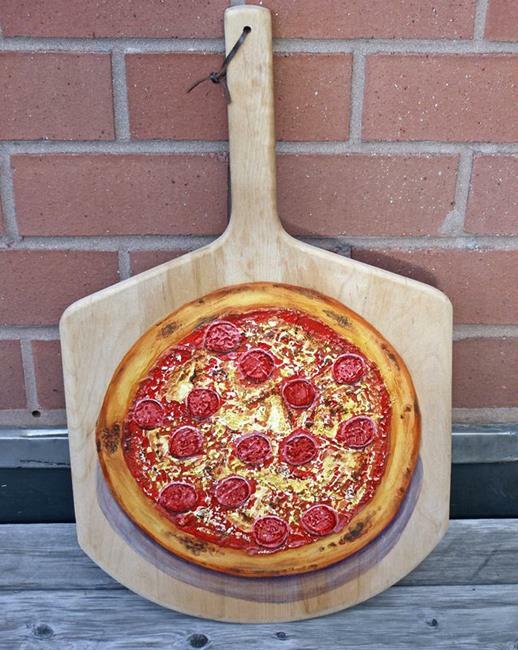 A fun way to serve pizza is on a “Peel”, or wooden pizza tray and that’s how I’ve presented my "trompe l'oeil" pizza art here. 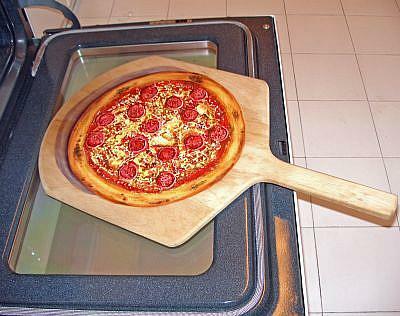 A "Peel" is a long-handled, wide wooden spatula-like implement that pizza pros use to quickly whiz pizzas into and out of burning hot ovens. It slides quickly and easily under the pizza crust, keeping hands safely out of the hot fiery oven. To create the artwork on this peel, I first laid down a blend of spackle or joint compound for texture, mixed with gesso in a round circle on the peel, and let it dry overnight. When it was completely dry, there was a textured support ready for the pizza paint to be applied. 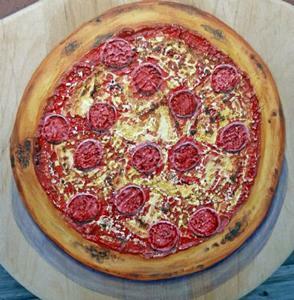 I proceeded to add each layer of paint, in the same way a pizza-maker would add the items to the dough. I thought what a fun, whimsical idea to paint a pizza on this peel & enter into the FOOD ART show. 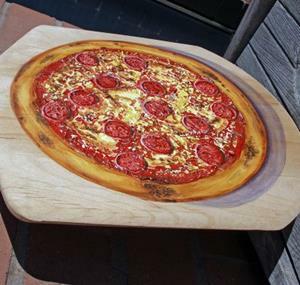 It’s a perfect conversation piece at your table when serving pizza. I signed the back, & it measures approx. 14x24x1" total, (but image area is 14x16". PLEASE NOTE: This peel should not go in the dishwasher OR oven, it is a piece of Art, and should be treated as such! Recipe for Tasty New York Style Pizza: Ingredients needed: Dough, Tomato Sauce, Cheese and Pepperoni. For best results, all ingredients should be FRESH! Roll & flatten dough with rolling pin, onto floured surface. Spoon fresh tomato sauce, spreading it all around to the edges of the dough. Top with mozzarella cheese and pepperoni to taste. Heat in a (preferably) pre-heated wood-fired pizza oven at 550 degrees Farenheit for two minutes and MANGIA ITALIANA! approx. 14 x 24 x 1"